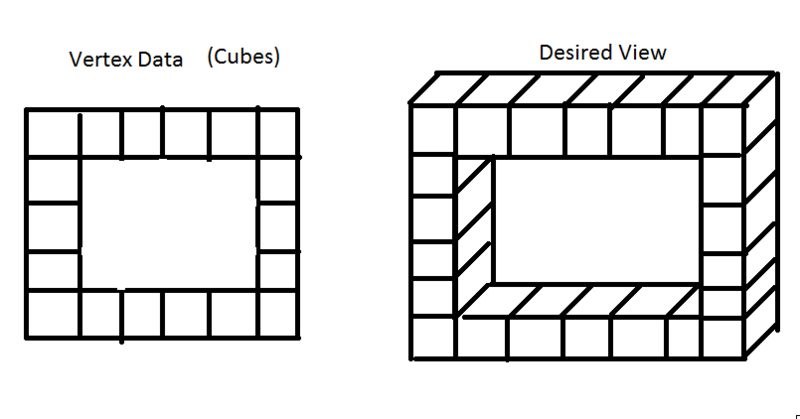 Cubes are simply made up of 8 vertices and drawn using DrawUserIndexedPrimitives(). Any extra suggestions, are also welcome. If what you want is indeed like your drawing suggests, then you're looking to implement an oblique projection. Check this video for an example of this type of projection in a game. The big difference is that the game in the video uses a set of pre-made tiles, while you're trying to do the projection mathematically. For starters, here's a picture which should make evident the difference between perspective, isometric and oblique projections. Use it to decide which of these you really want. For a Perspective Projection, simply use one of the Matrix.CreatePerspective family of methods. For an Isometric Projection, use one of the Matrix.CreateOrthographic family of methods, and rotate your camera (or your objects) a bit in the X and Y axes so that they match the isometric look. Set up an orthographic projection matrix (for which XNA already has helper methods). That's because both oblique and orthographic projections are types of parallel projections, so it's better to start from there. Set up your camera so that it is looking down the Z axis, i.e. perpendicular to the XY plane. You can pan the camera around, but never change the angle it's facing. This should make vertices that are further away from the camera, be rendered more to the right, and up from their original positions. XNA help - too much memory used? How can I efficiently store Vertex data in C#/XNA? How to implement simple shadows on XNA?